Play Worcester Bravehearts series Friday for summer league title. The MV Sharks ended a scoreless pitchers’ duel with a five-run sixth inning on Thursday night to beat the Brockton Rox by a 5-0 score at the Shark Tank in Oak Bluffs, and will move on to the championship round of the Futures Collegiate Baseball League (FCBL) playoffs Friday night at the Shark Tank in Oak Bluffs. The Sharks took the semifinal series two games to one. After dropping the opener at home to the Rox by a 7-5 count on Tuesday, the Fins rebounded to win a 3-2 nailbiter on the road to even the series on Wednesday in Brockton. Sharks lefty Shawn Babineau dominated Thursday night with a four-hit, one-walk, five-strikeout line over six innings, and the Sharks made him the winner in the bottom of the sixth, sending 10 men to the plate, scoring five of them. They had managed only four hits off Rox starter George Goldstein over the first five innings. 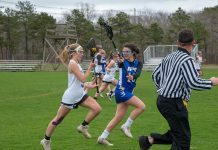 The winning scoring burst indicated why the Sharks are going to the championship round. Seven of the first eight Sharks reached base in the sixth via walk or base hit. 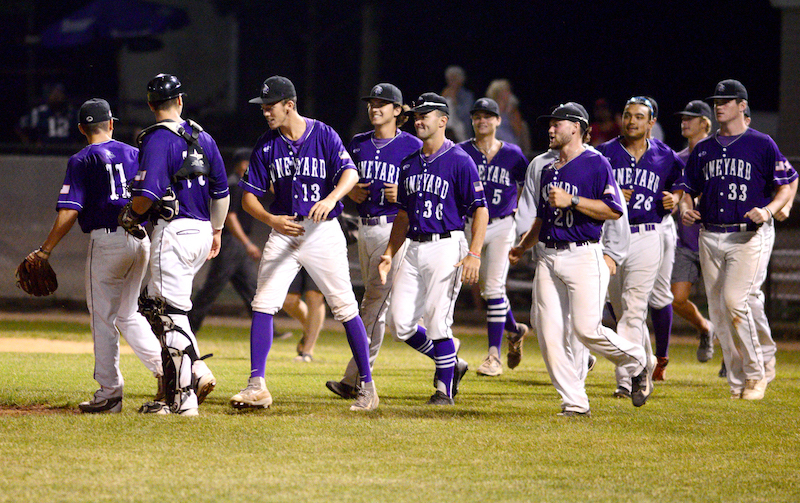 Collin Shapiro and Matt Chamberlain began it with singles before Kellen Hathaway dumped a crafty sacrifice bunt, moving the runners to second and third. Designated hitter Matt Oldham was intentionally walked to load ’em before a patient Ian Foggo worked a nine-pitch walk to force in the first run. Jackson Raper then stung a long single into the left-center field gap to plate two more. Tate Kolwyck singled in another, and Tate Hagan walked before Josh Spiegel drove in the fifth run with a ground-ball out before Shapiro, the tenth Sharks batter of the inning, made the final out. Devon DiMascio pitched two scoreless innings before Nate Tellier, voted this week the FCBL’s top pro pitching prospect, struck out the side in the ninth to nail it down. Now it’s the Bravehearts in a best-of-three series for the championship. The teams play Friday night at the Tank at 7 pm, and on Saturday night in Worcester. A third game, if necessary, will be played Sunday night at the Tank at 7 pm.